Shares of XPO Logistics were grounded in August following the release of its second-quarter results and weakness in China. Is this dip your opportunity to hop aboard, or all the more reason to stay away? Shares of XPO Logistics (NYSE:XPO), a transportation and logistics company that provides ground, air, and ocean transportation services, as well as supply chain optimization solutions, tanked 19% in August, based on data from S&P Capital IQ, after reporting disappointing quarterly results and getting caught up in the stock market correction. For the quarter, XPO Logistics reported a total gross revenue jump of a whopping 109% to $1.2 billion, although this was inclusive (for at least a few weeks during the second quarter) of the operations of Norbert, which it acquired for $3.5 billion this year. On a bottom-line basis, XPO's net loss shrank to an adjusted $0.16 per share from a year-ago loss in Q2 of an adjusted $0.22 per share. Unfortunately, Wall Street was looking for a narrower loss of just $0.14 per share. Individually, XPO's transportation segment, sans its acquisition, saw 4% organic growth on a year-over-year basis, or an estimated 10% if the impact of lower fuel prices is phased out. Net revenue margin for this segment also rose 150 basis points to 22.5% from the prior-year period. For its logistics segment, net revenue came in at $314 million, although the segment was dragged down by an operating loss from its European business. Image source: XPO Global Logistics. Aside from missing on EPS, XPO Logistics also struggled with the market meltdown in the U.S. and in China. Companies that move goods around the globe are particularly susceptible if arguably the world's No. 2 economy is experiencing a slowdown (or in China's manufacturing sector's case, a contraction). If China's government can't use the tools at its disposal to rekindle its economy, it's possible XPO Logistics and its transportation peers could see their top and bottom lines weaken. However, XPO's quarterly results did have one major bright spot: Based on the company's rapid expansion, it now foresees $23 billion in revenue and $1.5 billion in EBITDA in 2019. For added context, XPO is expected to generate $6.6 billion in revenue this year, and it's produced $109.3 million in EBITDA through the first six months of the year. In other words, we're talking about insanely quick growth in the upcoming four years. 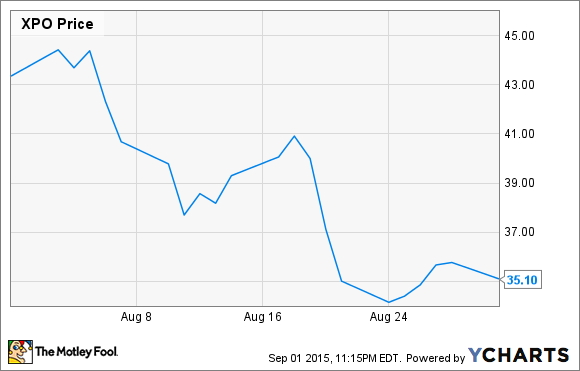 So, should you buy XPO Logistics following its tumble? To answer that question, I believe you really need to look within and understand your risk tolerance. With XPO generating substantially better EBITDA post-acquisition, its $3.8 billion in debt is no longer as big a concern. However, we can't ignore the fact that its forward P/E is 82, and even three years down the line, its P/E would work out to near 30. Yes, the company is growing at a rapid pace, but it's not without possible flaws, which include exposure to a global economic slowdown. To sum up, if XPO Logistics can hit its 2019 targets, then yes, I'd suggest there could be ample upside to its stock price over the long run. But that big "if" depends on China righting its ship and the EU finding some way to trudge forward beyond Greece. XPO Logistics is no slam dunk, but I'd call myself cautiously optimistic here.